kevlar/Carbon Fiber Main w two reefs in Good condition. Dacron Main w/2 reefs - In good condition. Cals are all hand laid up hulls and decks with very strong standing rigging. The Bill Lapworth design is well known. Obviously well built since most of Jensen Marine's sailboats are still out there racing and cruising. At 17,000 lb. displacement the boats are great heavy weather sailors. As you enter the boat from the cockpit, the galley is on the port side. A deep, double-doored refrigeration chest is on the aft end of galley. The three burner propane stove with oven is on the port side with the sink to starboard. A quarter berth is located to starboard with the nav station just forward of it. The nav station includes a swing out stool. Moving forward the convertible dinette is to port with seating to starboard. The starboard seating converts to an upper and lower berth. The table can be opened to create a large crew dining area. Forward of the dinette is the large head with vanity. It also has a Vacuflush head. The forward stateroom with V-berth is next. It includes two hanging lockers and several drawers. The sail handling deck gear includes adjustable Genoa Cars with block and tackle. Jensen Marine, also known as Cal Boats, was a major sailboat builder in the 1970s and 80s. Best know for several models: Cal 20s - Cal 25s -Cal 2-30s - Cal 39s and of course the Cal 40. Originally know as light displacement racing boats, it was soon discovered they were very comfortable family cruising boats too. Even in this day of ultra-light racing boats, Cals are still recognized as very competitive, strong race boats. The present owner of this Cal 39, used it for some cruising but primarily for local club racing. During it's racing career it took 1st place in the Foul Weather Bluff series. The large cockpit and wide side decks make this design easy to sail. The interior has a great forward stateroom, usually filled with sails, and plenty of crew space aft. The large quarter berth has always been the best berth on board for long races. A large galley with refrigeration and a three burner propane stove with oven, lots of storage, and a head with Vacuflush complete the package. This Cal 39 has been personally photographed and viewed by Roger Drill of Boatshed Seattle. Click here for contact details. Please note this comments section is public. Please do not post your personal details here. 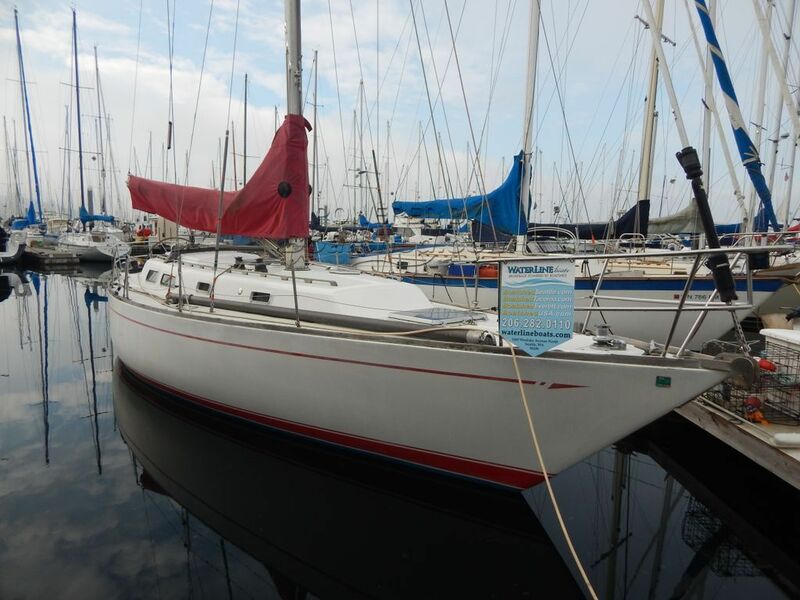 To enquire about purchasing this boat, please contact the broker directly at roger@boatshedseattle.com. Please read our commenting guidelines before posting.